Meizu has released a poster, teasing fans with the launch of the brand’s first 18:9 smartphone slated on January 4. 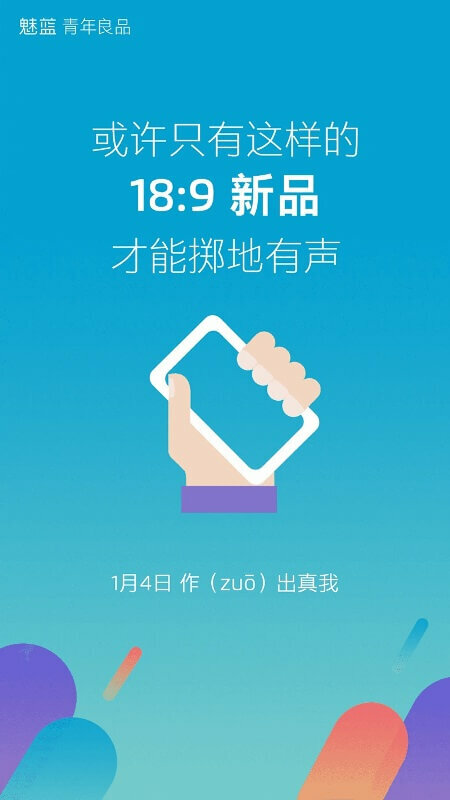 According to rumors, the smartphone could be the Meizu M6S – also dubbed as the Blue Charm S. Aside from being the brand’s first smartphone to boast 18:9 display, it will be the first Meizu handset to feature a fingerprint scanner mounted on its right side, too. The device won’t feature physical home button in front, as well, to give more space for its 5.7-inch screen. Under the hood, the device is said to be powered by Samsung Exynos 7872 hexa-core processor, complemented with 3GB of RAM and 32GB of internal storage, or a bigger set of 4GB of RAM and 64GB of internal storage. The device will also sport 13-megapixel rear camera and 5-megapixel front shooter, and will be packed with 2930mAh battery.